Okay – so the stage has been set with the first post, ICW 1, but before I can even begin the story of our journey (which, as of this moment is still in front of us), I’d be doing the story an injustice if I didn’t first introduce the boat that is a new part of our family. 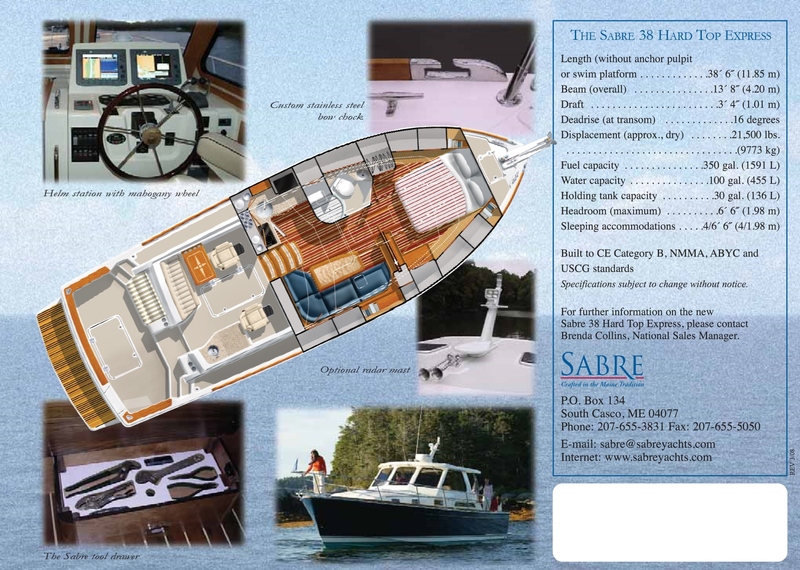 Sequel is a 2006 Sabre 38 Hardtop Express, built by Sabre Yachts in Casco, Maine. 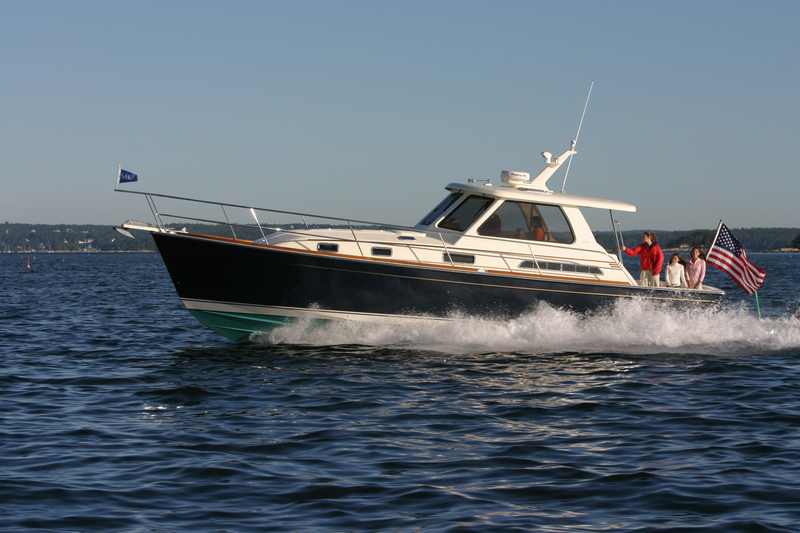 She’s a downeast style cruiser, with a 38′ length at the waterline – about 43′ in length overall. For power Sequel has a pair of 380HP Cummins QSB5.9 electronically controlled, common rail diesel engines that give her a top end of about 30 knots, operated by a TeleFlex drive-by-wire throttle and shifter system. She carries 350 gallons of fuel, 100 gallons of water, oh and 40 gallons of “black” water – three capacities we’ll need to keep an eye on during the trip. She also has an 8kW Onan generator to keep things powered up while on the hook, including four separate air conditioning systems to keep things cool. Leading down five steps from the helm deck is an interior that is very nicely laid out for a couple on an extended cruise (I’m beginning to sound like a sales brochure), and can easily accommodate guests, as the salon table lowers so that the addition of filler cushions the salon converts into a guest room. We like that there’s a built in wine rack in the salon too – I’m telling you, this boat was designed for us! The helm deck has a pair of (very comfortable) Stidd helm seats, along with an L shaped settee with a beautiful pedestal table. The Stidds can pivot aft and lower to face the settee, and there’s a second ‘fridge, ice maker and sink here so we won’t have to worry about cocktail hour! Aft and down two steps from the helm deck is the cockpit with a pair of benches facing each other, along with the required drink holders and a receptacle in the sole for another pedestal table for alfresco dining. Up three steps both port and starboard are wide side decks leading to a fairly expansive bow (perfect for sunning! ), where there’s a 40 lb QCR anchor on a chain / rope rode (the length of which I don’t recall, but will no doubt find out pretty soon..). Of course, all this (and much more) has been done some 1,500 miles from our home in Boston. The only time we’ve seen Sequel (well, she had a different name back then) was in April when we went down for the marine and engine surveys and sea trial. Still – we fell in love with her, and she’s only gotten better since then. Following are a few images of Sequel, some as recent as yesterday (emailed to us), by way of introduction. So that’s about it for now. Once we actually get to the boat on the 12th I’ll post some more pics of her, but this should be enough to give you an idea of our new girl. Below is from when we were on the sea trial in April. Very much enjoyed being on the boat – luckily, since we’re about to spend a lot more time on her! Next up in ICW 3 I’ll share a bit of the work we’ve been doing getting ready departure day.